It's time to get tacticool. Item Crafting, taken Up to Eleven. In many video games, you often are tasked with completing given objectives with the tools, equipment, units, or vehicles that are given to you by the game's designers. Often this can be an inflexible situation. Not so much with DIY, or Design-It-Yourself Equipment, as the game designers give you, the player, the power and ability to craft your own instruments of destruction, typically with some form of in-game editor. Generally, any game that allows (or in some cases, requires) you to create your own tools for your use in the game environment falls under this trope. Used frequently in serious racing Sims, Real Time Strategy, First Person Shooters, and many other genres, and ranges from purely cosmetic design choices (such as different custom paint-jobs on a vehicle) to customization of existing items, to being a critical and integral part of gameplay with designing equipment from scratch. Depending on how well it is implemented into the game, It can be a unique and refreshing way of playing the game. Done poorly, and it may result in an utter Game-Breaker. Or a Scrappy Mechanic, if the usefulness of the custom equipment falls too far on the other end of the spectrum. Not to be confused with An Interior Designer Is You. That deals with designing interiors or the insides of rooms. See also Item Crafting (which allows the player to make their own gear, but doesn't always let them customise it), Randomly Generated Loot (when the game decides on the player's equipment's stats at random), and Spell Crafting (a similar trope about magic instead of items). BattleTech and Car Wars both used this. In both, you picked a basic chassis/frame and then added whatever you wanted, up to weight and money limits. For example in Car Wars, you could mount an Anti-Tank Gun on a compact car, or anything larger, but not on a subcompact. Mekton uses this as something of a selling point: you're not going to war in Standard Mech Design 837, you're using a model you designed and equipped. The system was versatile enough to design everything from your personal favorite handgun and motorbike, up to a full Ship of the Line - or more, if "Excessive Scale" is used. In Rogue Trader, the eponymous Intrepid Merchant's Mile-Long Ship can be customized with any number of weapons, generators, shields, and other bits of equipment, from the traditional (a bunch of space-torpedo tubes, perhaps?) to the downright bizarre (if you've ever wanted a spaceship with its own brothel and drug dispensary, there's an upgrade for that). Traveller features variations on this theme. All versions feature rules for designing spacecraft, and The New Era included quite complex rules for creating custom weapons... that tended to produce the same results every time. In 2nd Edition, wizards and clerics gained the ability to make magic items starting around 9th level, with harder rules for consumables and charged items (such as wands), but looser guidelines for permanent items like weapons and armor. The Game Master was expected to come up with some outlandish materials and processes necessary to produce those items, and the players would go adventuring to get what they needed. 3rd Edition had firm rules to estimate how much an item should cost to create based upon the effects you wanted it to have, since a certain value of magic equipment was taken into account as part of the power curve. The rules weren't perfect, but they were a decent starting point and encouraged the GM to adjust as necessary to control attempts at exploiting the system. Item creation was as a consequence no longer based around adventuring to get something made, but instead became a set of costs your character paid during a set period of downtime. 3rd Edition also introduced the Eberron setting with the Artificer class, focused around Item Crafting and encouraging players to come up with their own toys. Planet Mercenary provides standard weapons and armor as offered via the eponymous in-universe company's catalog, but also includes rules for creating custom weapons and armor and what the resulting cost should be. In Children Of A Dead Earth, the game comes with a usable selection of serviceable designs, but the dev's stated objective is to see what space warfare ends up looking like after the players have had a chance to design their own creation in search of the optimum designs and tactics. And the design is very detailed. How detailed? An example: designing nuclear reactor has you being able to choose things like materials for nuclear fuel, fuel enrichment level, fuel mass, neutron flux level, moderator material + mass, neutron reflector + thickness, coolant pump material + fan size and rotation speed, coolant type, outlet temperature, P and N type composition of the thermocouple and the length between them + overall size of the thermocouple. And this applies to other modules as well. In LittleBigPlanet 3, you can create your own power-up through the new Powerup Creator in conjunction with dozens of logic gates, microchips, tags and emitters. The Pop-it Powerup on the other hand is a portable Level Editor which functions in-game. Players are encouraged to decorate their Toy-Con however they see fit, with officially made Customization Kits available for purchase as well. Given that the labo garage is basically a programming system in and of itself, people are already starting to come up with their own games and other such things involving it, with one player managing to recreate the first Game & Watch game, 'ball', in it. Sid Meiers Alpha Centauri. Do you want a Nerve Gas fighter-bomber with Air-to-Air missiles and psionic defenses? A cruiser with a time-travelling particle beam, a radar facility and the ability to double as police in any harbor it enters? An espionage capable tank with drop pods, armor made from spider-silk woven steel, and extra resistance to hacking? A buggy-mounted artillery piece that launches fungal spores on enemies, with resonating armor made from alien technology and a built-in teleporter? How about a hovering fighter with psychic armor that launches psychic attacks and is extra-resistant to wildlife? In short, if you could imagine it, in SMAC you could build it. Of course custom units do cost more credits to build, and if you really go wild you'll end up with something that can take your faction's entire income to build just one of. Both Dark Cloud and Dark Chronicle have this as a main mechanic. Crystals are synthesized into weapons until the equipment can morph into a new weapon of a higher level. Pretty much the whole gameplay gimmick of Banjo Kazooie: Nuts and Bolts. In Blacklight Retribution this is combined with a leveling system and a surprisingly non-evil renting system to result in an insane amount of aesthetic and functional weapon customization. Advertised as the entire point of Spore — creating your own creatures, buildings, vehicles, spaceships. In the actual game, only the combination of a very limited number of elements on your creature mattered; all other designs were cosmetic. Loadout basically revolves around this as its main draw. In Robinson's Requiem you could combine nearly everything you found in several ways in your struggle to survive. You could even create several methods to kill yourself in interesting ways. Earth series, starting with 2150. Tanks and other vehicles in that game could be designed from scratch, almost down to the individual nuts and bolts on a vehicle's chassis. In 2150, this was restricted to choosing chassis, shields and weaponry. This trope comes to play in 2160 where aside from these, you also get to customize the engine (fast engine for more speed, classic engine for balanced and powerful engine for boosted shield recharge) and the armor (classic against kinetic only, reflective against energy and kinetic, anti-chemical against acid and kinetic). Hull design is determined by armor type but for aircraft, engines are a factor toonote for example, the LC aircraft's speed engines have a green glow, classic engines have a purple glow and powerful engines look like old-school jet engines. The PC game Warzone 2100, which featured vehicle design from scratch fairly prominently. An advertisement from 1997 boasted over eight million different component combinations. The Armored Core series featured the capacity to design Humongous Mecha completely from scratch. The Front Mission series. Also enabled you to design Humongous Mecha completely from scratch. Gran Turismo, to an extent- internal customisation is incredibly varied, but visual modifications are very few and limited to aerodynamic improvements. Need for Speed: Underground took Gran Turismo's customization and attached it to a battleship full of angry bees. The Naval Ops trilogy featured a ship editor called HLG61. It allowed the player to completely customize every part of their warship. So you get to choose the hull of your ship(s) (anything from a submarine to an enormous drillship), the armour level, the bridge, aircraft, the weapons, smoke stacks, boilers, engines, and special systems on your ship. With this level of customization and the raw power of higher end items, making a Game-Breaker ship is easy. Galactic Civilizations also has ship editors in-game. Sins of a Solar Empire plays with this somewhat, even more so in its recent expansion Entrenchment, with the ability to highly customize starbases. Ships and economy buildings are stock, though. Grand Theft Auto: San Andreas featured the ability to customize some vehicles to enhance their performance and appearance: Usually your car would only really benefit from the nitro speed boosters, but feel free to blow money on the golden dollar-symbol hubcaps and pimp hydraulics. The main selling point of Impossible Creatures and its Mix-and-Match Critters. But your baddest melee creature will still probably be a demi-lobster. In the Master of Orion series, you are able to design your own space ships. Moreover, Master Of Orion 2 allows modification of specific weapon group depending on known technologies, and refitting of existing ship. Stars! allows players to create unified ship and starbase designs by placing groups of components in functional slots. But no unique ship, every last one belongs to some design scheme. In Ascendancy you design a ship by placing components on the "deck map" one by one. Cyber Storm allowed the player to customize their fleet of fighting robots, as well as oversee the training of their semi-human pilots. City of Heroes introduced a Weapons Customisation feature in an update that allows players to choose a variety of different skins for each of the weapon-using powersets, some of which are unlockable, and many of which can be colour tinted. It's purely cosmetic, however. Final Fantasy XI introduced an augment system for equipment around the time they started releasing the mini-expansions, with special equipment also using this system being the final reward for two Add-Ons. Augments that are NOT the final Add-On rewards are completely random, however. Later iterations of the latter make it easier to be persistent until you get something you like, in a manner not entirely unlike Save Scumming with a materials cost. Probably the closest to this trope would be Alluvion Skirmish gear, which have three specific "slots" for augments which you can reroll one at a time until you get almost exactly the combination you want. Final Fantasy X does this with the Customization feature. You can put any abilities that you have the stuff for into the weapon or armor, unfortunately the better items are ridiculously rare Random Drops or available by bribing monsters that are beyond the Point of No Return. Making these is pretty much the only way to get some abilities, like Break Hit Point Limit or Break Damage Limit outside the Celestial Weapons. Master of Magic allows player to create custom magic items for heroes. Its Spiritual Successor Age of Wonders allows player to create custom magic items for heroes or wizards in the cities with "item forge" building. In the campaign, this results in the strategy of spending a little while at the end of one level hitting "end turn" until you have the resources to make mind-bogglingly powerful weapons to use for the rest of the campaign. Kingdom Hearts and Kingdom Hearts II allow you to create and edit Gummi Ships. Fire Emblem: Path of Radiance/Radiant Dawn have a forge to create weapons. Basically, it let's you take a generic weapon, choose a colour for it, and mess with its stats. Each increase in a stat raises the price. The more important the stat, the more the price goes up. For whatever reason, decreasing a stat below normal also costs more. The two Privateer spin offs from the Wing Commander series allow you to customize whatever ship you're currently using. Especially in the original Privateer, though, there's only a few pieces of equipment that are worth equipping, and the rest is just for "make do" until you earn the money to pay for the good gear. Vega Strike gives player a good choice of ships and equipment for different tasks — there's at least three viable strategies for optimization of beam weapons alone (range, DPS, DPS through shield) and some practical limitations (like hull volume and reactor's power) that avert "one is obviously better" trap even more. Summon Night, specifically the Swordcraft Story games, where you have to make your own weapons rather than finding them in a dungeon, though the dungeon itself is used for finding the materials to build your weapons in the first place. NetHack lets the player wish for items if they find a means of getting said wish. The trick here is that the player can also wish for modifiers to said items. Some of the more popular wishes include: blessed greased + 2/+3 grey / silver dragon scale mail, 7 uncursed candles, cursed potions of gain level, and magic markers. Infinity: The Quest for Earth's ships are based on a "non-specialization principle"; that is, any ship can be used for any purpose (although obviously some are better at certain things then others) if outfitted properly. The entire point of Robot Arena. You must design a robot from scratch, using the parts provided by the game (like pistons and wheels and engines and of course various kinds of weaponry), paint it, decal it, and control it in a deathmatch with other robots. The trick of course was to keep the weight of the robot to a minimum, and also to make good use of the limited space inside the robot's chasis. Legend of Mana almost WALLOWS in this trope, as the player can build weapons, armor, musical instruments (used ingame for magic spells) and even custom robot sidekicks. There exists a subset of Mana players whose sole reason for still playing the game is creating recipes for new items. Throughout The Elder Scrolls series, starting with Daggerfall, Spellmaking is an option. Spellmaking allows you to create spells of varying strengths and durations, or to combine the effects of multiple spells. Once these become available (and the player can afford them,) they usually render the majority of the games pre-made spells obsolete. In the Genesis and Game Gear versions of Home Alone, Kevin has to assemble all of his weapons other than the BB Gun. In general, the only difference is what the weapon fires or what the trajectory is. In the easier difficulty, the game will automatically suggest combinations based on what he's collected so far. The harder difficulty has a few exclusive parts, and thus exclusive weapons. An upcoming FPS They touts the "Weapon Tuning System" as a major feature. The Neverwinter Nights expansion Hordes of the Underdark gives you access to a forge at the beginning of the second act. If you've got the gold for it, you can make some pretty insane weapons, like a Keen Flaming + 7 Longsword... that's still called a + 2 Longsword, because you can't change the names of the weapons. The game's built-in Level Editor takes it a step farther, allowing you to load up a character with custom-made Infinity Plus One equipment, then import that character into a normal game. Want a + 20 Flaming Frost Shocking Greatsword that casts Hellball with each hit? That'll teach those goblins in the tutorial level. In Overlord the overlord can only use weapons and armor made specially for him. While available designs and materials are limited, said items can be given special effects by sacrificing Minions. Lots of Minions. Navy Field features customizable World War II ships. You can change out engine, guns, torpedoes, ammo type and quantity, armor, fire control, aircraft, and crew within specified maximum limits based on weight and physical size. Of course, bigger guns have larger shells and on a tiny ship that can really limit your ammo. The guns even have a few quality modifiers for guns where an "L" gun will have longer range but weigh more while a "D" gun of the same caliber will have less range but weigh less. The player could design a weapon of their own in Worms 4, complete with adjustable variables such as knock-back, terrain destruction potential, and even whether or not its rounds could poison enemy worms. Trinity Universe has the managraphics system which lets you repaint weapons with bizarre themes to have slightly different abilities. The old Amiga game K240 had this, basic ships had only hp, no weapons, those were added onto Hardpoints, with ships having from 1 - 6 depending on size. It wasn't just weapons either (of which you got air-to-air and air-to-ground types, you could also get several different types of defences. The same applies to its PC remake, Fragile Allegiance. Sword of the Stars, a turn-based 4x game, has this with ships. Ships are made with a number of interchangeable sections (3 sections for ships in the original, but the first two expansion packs added the Zuul, who have some race-specific ship types with just 2 sections, as well as drones and Morrigi ships that make their fleets faster with only 1 section), plus each section has hardpoints to attach weapons to. There are 3 sizes of weapons hardpoints, a weapon must be the same size or smaller to fit, with smaller weapons than a hardpoint's size leading to multiple barrels, there are also specialized hardpoints such as for missiles (which also utilize the size system), drones, and beam weapons. Most sections also have checkboxes for (reflective) armor and engine sections have checkboxes for fuel options as well. Interplay's Tanktics is all about producing DIY tanks (what else?) from scratch and pitting them against the enemy. In the purely aesthetic corner, Drawn to Life. It's the main gimmick. This is literally half of the game in Gratuitous Space Battles. The other half is watching these designs fight in the aforementioned battles. World of Warcraft allows this to some extent with gem sockets on higher level items, which allow you to mount gems that provide stat bonuses depending on their type. The Cataclysm expansion temporarily introduced Reforging, where you could actually reallocate the intrinsic bonuses built into an item. Warlords of Draenor introduced the option to reroll the secondary stats on crafted items where in previous expansions these stats were pre-determined. The highest level crafted items could also be upgraded multiple times, keeping them relevant for more of the expansion. Elemental - War of Magic allows you to arm, armour, clothe and outfit your sovereign, heroes and your entire army to whatever specifications take your fancy. Want everybody in your Legion of Doom to wear a fez? Go ahead! In a combination of webcomic and adventure game, Wicked Awesome Adventure encourages its players to design equipment out of pocketed items. This has led to unusual (and occasionally Game-Breaker — swiftly confiscated by the Duck) items like the Swear-jar F-bomb, the Vevuzela Speargun, the Brusherhang, and the Rubik's Hypercube. Star Ruler has this for starship design. Players first set the scale of the ship (anywhere from the size of a Coke can to larger than the galaxy), then the player begins by placing a type of hull (carrier, light, heavy, etc), power plants, thrusters, weapons, armor, shields, control systems, and support equipment (such as mining lasers, repair lasers, stealth fields, etc) to the ship's design grid. Finally, the player can set default AI behaviors for the ship, such as target preferences. How many objects, their relative complexity, and the size of the ship determine how many resources are needed to build the ship. Star Ruler 2 replaces the somewhat esoteric circular design grid with the ship's actual cross-sectional blueprint, and allows players to designate firing arcs. Infinite Space allows the player to customize their ships with a variety of weapons and modules. The nationality of your bridge module even changes the views displayed while cruising and fighting. MS Saga: A New Dawn breaks Mobile Suits into several parts (arms, legs, shoulder armour, etc.) that can be swapped and repainted. Freedroid RPG allows to craft addons from broken droid parts and install them on some items. X-COM: Apocalypse allows to fit vehicles for your purpose — changeable engines, weapons and other parts you can buy or build. Aurora has a lot of this. Individual traits for most ship component have to be researched independently. Only then can you design components with those specific traits and stats. And finally you can start researching those components for use in ship design. To top it off, most components have selectable sizes, armor protection, and further traits such as sensor resolution and EMP resistance which makes every single designed component different from others of the same type. So players have to design and research multiple versions of active sensors, fire controls, energy weapons and missiles to fit on their ships to receive optimal performance. And that's not including engines, shields and other vital components. Player-designed fleets contains multiple types of ships, each ship being as complex as their closest real life counterparts. Champions Online and City of Heroes both have simply amazing customizeable costumes for the character. This can lead to some remarkably creative costumes, as well as positively eye-blinding ones. As mentioned above, however, this is purely cosmetic. Way of the Samurai brings this to the fore in allowing players to design their own daggers, swords, and spears. This is extremely important because the weapon held was the only thing determining the nameless samurai's attack and defense levels. A wide variety of blades, grips, hilts, and pommels were available to mix and match. Some were obvious sets designed to go together (such as the 'Shark' prefix-set of 3), while others were simply individual parts which could be put together on the player's whim. Also notable for allowing players to also choose the special attacks in their sword by determining its stance, then using a Point Buy system to allocate any skills learned from weapons with that particular stance. Combining parts with regards only for stats sometimes made high-power weapons into the swordsmithing equivalent of Rainbow Pimp Gear. While most EVE Online ships are customizable with modules, only tech-level 3 ships allow the player to swap entire sections of the ship. Mechanically, you can swap out engines, drivetrains, and in some cases engine aspiration, or simply upgrade the existing engine. You could get a Dodge Neon with a V10 engine from a Dodge Viper with the AWD drivetrain from a Dodge Stealth. Once you've put on your upgrades, you can then tune the car, to alter its handling characteristics. One might make first gear longer to reach a higher top speed, or reduce it for break-neck acceleration, then tweak the differential to adjust how easily the tail slides out, then adjust the suspension and anti-roll bars to induce oversteer or understeer. Visually, you can give most of your cars aftermarket body kits (which often affect the performance, especially with spoilers. Most simply reduce the overall weight slightly), and in Forza Motorsport 4, you can give OEM body kits, such as swapping out the front end on a 1980s Porsche 911 Turbo with the front end from a standard Porsche 911, or give it the stripped down racing front end. Rims can be swapped out for hundreds of other rims (which affect the car's overall weight). The most notable feature of the customization, though, is the Vinyl Editor / Decal Editor, which allows you to place thousands of decals on your car to make liveries. A player might drive said Dodge Neon with a replica Martini livery, depict the Master Chief fighting Gordon Freeman, or simply have racing stripes or go-fast stickers. Cataclysm has a grid based vehicle construction system with different types of parts able to share the same tile. With enough skill, items, and time it's possible to build anything from a scooter to a tank to a motorcycle with several large truck engines that's capable of going over 500MPH. Ride to Hell: Retribution has a vehicle construction system, although you can't expect much, seeing as this is one of the worst games ever. Indie multiplayer game Gimbal features an extensive ship customization system where you select a hull and tack on as parts as you can (depending on level/budget). If you wish, you can make a ship that derives its thrust from around a dozen Flak Cannons. Spy's Customizable Weaponry (especially 2.0) in Garry's Mod allows you to customize weapons to a varying amount, most notably the AR-15 that allows you to change sights, barrel types, the Hollywood Silencer attached to said barrel, underbarrel options, stocks, ammunition types and magazines. Though an important aspect is handling, attaching items can reduce handling (which means your mouse sensitivity with the weapon) to simulate a big, unwieldy weapon. Player characters can equip kits that provide powers in ground combat in addition to what they learn by leveling up. Kits are assembled by slotting modules into a frame, allowing players to select their own mix of ground powers. Each class has its own set of powers and cannot equip modules or frames intended for another class. Ships can be "kitbashed" at shipyards, assembling a unique vessel using parts (saucer, nacelle, etc.) from a family of related ship classes. This is purely visual and adds a lot of variety to what you see flying around. Kerbal Space Program allows you to design and build your own rockets and other craft from scratch using sets of specialized parts, letting you construct a wide variety of landers, probes, space stations, rovers... or you could forget about the whole 'space' nonsense and build jet fighters, cars, boats, submarines. With the aid of mods, even battleships, carriers and humongous mechas are possible. Wizard101 has the option for players to merge an items appearance with another items stats. This is a way to edit an item in a purely cosmetic fashion, letting a player essentially chose their own look and not have to change it whenever they get new gear. This was mostly done to prevent players from having to deal with Rainbow Pimp Gear to have the best stats. Endless Space's blueprint system allows players to customize their race's starships and upgrade their performance. Different modules and weapon systems can be installed with different abilities, such as siege weapons for slow but guaranteed planetary capture, bomber storage to directly attack enemy population and infrastructure, or troop modules to directly invade and take over system in one turn with enough force. A similar variant appears in Endless Legend, albeit for troops rather than spaceships; different types of weapons, armor, and trinkets modify the unit's stats and sometimes its abilities. Pandora: First Contact, the unofficial Spiritual Successor to Sid Meiers Alpha Centauri, has a less pronounced ability to customize units, but it is still incredibly useful, as it allows you to design specialized units for a given task. For example, you can arm your infantry with machineguns against biological enemies (including the native life) or with rocket launchers against armored units. There are other weapons, such as lasers, that deal equal damage to different types of enemies, many types of armor and equipment. Units can also be upgraded to already-existing templates of the same basic unit type. Sid Meier's Starships has customizable ships. Automation is designed to be a car company Simulation Game that embraces this to the limit. The game lets you do the next best thing to blueprinting your entire engine, top to bottom; fuel system, valvetrain, cylinder layout, compression ratio, bore, stroke, everything. There's nothing stopping you from making a high-revving one-liter DOHC V8 or a torque-monster four-liter OHV inline-4 — or, on the extreme other end, the almost-exact inline-six engine from the 1964-1/2 Ford Mustang. And that's not even getting into your ability to customize the rest of the car. Dead Space 3 has one cobbling together "weapons" (read: "cutting tools to maul necromorphs to death with") from spare parts. Fallout 4 has an absurdly expansive customisation system for your weapons, armour, suit of power armour, and even your settlements. 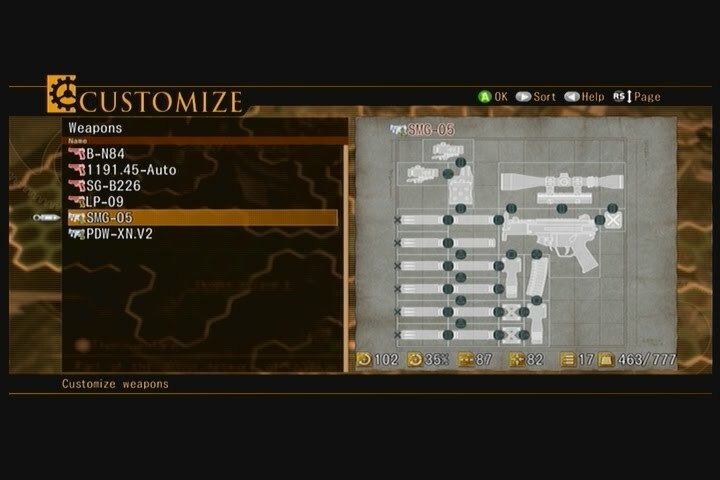 There are over 700 different mods to change the barrel, scope, ammo, grip or stock of around 50 or so base model guns. So, for instance, you can take a standard laser pistol and mod to become a variety of different weapon, including a full-blown rifle, a sniper rifle or a shotgun; or you can change a baseball bat so it has nails in it, or give it an aluminium body with a mahogany grip with circular sawblades on the end, along with other possibilities. This is taken into ridiculous extremes with pipe weapons, as you can pick up an unassuming pipe pistol at the start of the game and gradually mod it into a mutant-killing, bullet-spewing battle rifle. And with the availability of a whole bunch of mods that greatly improve the amount of components you might well end up spending more time modifying weapons than actually using them to kill the aforementioned mutants. Scrap Mechanic is a sandbox game centered around the player's ability to create vehicles of arbitrary shape, size, and complexity. You can build pretty much any kind of wheeled or rocket-powered vehicle you can imagine, and the game's Early Access status means that there's going to be more and more capabilities as the game goes through development. Mechwarrior 2 and 3's mechlabs were ripped straight from BattleTech and had absolutely no limits besides tonnage and pod space, relying instead on the player's common sense to fit weapons according to mount type. Unfortunately, Min-Maxing your Mech to its maximum killing efficiency usually implied ignoring any semblance of common sense, which resulted in cannon hardpoints firing missiles, missile racks firing lasers, laser arms firing flamers and even hilarious setups like cockpit canopies and legs used as weapon hardpoints - firing whatever you'd mounted there from the knees. Mechwarrior 4 switched to a more abstracted system which removed pod space in favor of unique equipment and different amount of weapon slots (universal, or specialized ballistic, missile, or energy) on the mechs. A 'Raven' scout mech could equip a huge variety of sensors but lacked weapon space, while an 'Argus' had tons of ballistic and missile slots but almost no electronics. Mechwarrior Living Legends never got the Mechlab implemented thanks to legal issues, but design documents showed that it would have worked fairly similarly to Mechwarrior 4, albeit with fixed engine ratings per chassis and customizable weapon pods plus the obvious addition of player-usable tanks, aerospace fighters and helicopters. Mechwarrior Online uses a modified BattleTech system, with mechs having a limited number of weapon slots per section and equipment like electronic countermeasures limited to certain mech variants. Variants have "quirks" that benefit certain stats such as weapon refire rate or acceleration. In Phantasy Star Nova, there are two ways of getting Abilities onto your weapons: Using a Core during Item Crafting to affix a permanent Ability to the final product, and making and equipping Attachments. Through the Attachment system, you can craft different Attachments with specific Abilities, then mix and match Attachments on your weapons to get the best Abilities onto them. The fun part is that you equip Attachments by physically attaching them to the weapon through a menu that allows you to move and adjust the placement of your Attachments, and all Attachments appear in-game on your weapon's model. After an update to the Endgame+, you can now move Abilities across Attachments, allowing you to invoke a weapon version of Rainbow Pimp Gear. You can take a melee weapon such as Knuckles and equip to it a rifle scope, a cat face, and a ribbon, and it'll still roll over post-game content with the right Abilities. When you begin a new game you are given the opportunity to create your own empire and starting race. Here you can choose your races appearence, their biological characteristics and a list of names for randomly generated characters. For your empire you can choose their ethical values and their government form. You want to play as highly intelligent roaches that form a xenophile theocracy? Sure. Foxmen that live for centuries in a science focused military dictatorship? Why not. You can customize your ships and space stations at will. You can first choose the parts that make up the ship/station. Then you can fill their weapon and utility slots with unlockable items, while keeping a positive power balance. Mario Kart 7, in addition to bringing back the coins from Super Mario Kart, introduces gliders, and underwater driving, introduces the option to personalize the player's vehicle even moreso than Mario Kart DS (where each driver had a standard kart plus a unique kart) or Mario Kart Wii (where each weight class had its own set of bikes and karts). The player can select the kart body, the tires, and the glider to build the desired kart. By collecting many coins from the races in Grand Prix mode, the player can unlock a new body, a new set of tires, or a new glider to use. It is possible to acquire a maximum of ten coins in a race. As the user chooses the parts, the stats may vary according to the parts' combination, and the vehicle will work better in particular situations. Mario Kart 8 continues where 7 left off, and has even more variety, especially if you have all of the DLC packages. There are 37 vehicle bodies (22 karts, 6 outside drifting bikes, 5 inside drifting bikes, 4 AT Vs), 21 sets of tires, and 14 gliders available for usage. The math means that there's 10,878 possible combinations of vehicle, tires and glider. It is impossible for a combination to have any stat less than 1 or greater than 5.75. Furthermore, the vehicles are not weight-class restricted, so any character can get any vehicle. S.T.A.L.K.E.R. : Clear Sky and Call of Pripyat'' feature techs, stalkers that can tinker with your guns and upgrade them in two different trees (usually accuracy at the expense of DPS and vice-versa), and even swap its chambered caliber from NATO to Soviet (and again, vice-versa). These trees are mutually exclusive at a certain point and on, but there is potential for intermingling aspects of the two so you have the exact parameters you desire in your arsenal. In Planet Explorers you are able and even encouraged to design every item, weapon, apparel and vehicle yourself in an extensive 3d editor. This editor also takes in account what material you use and, in case of weapons, the shape you create your items in to generate its stats, like damage and durability. So, when you, for example, design a sword, you'd want to add sharp edges to it to increase the damage it does. Star Control II: your Precursor flagship has a modular design that allows you to outfit her for any purposes you can think of, as long as you have enough Resource Units to spent on modules: a tanker able to hold enough fuel to transverse the entire map, a battleship that can mop the floor up with even Ur-Quan dreadnoughts, a mining ship able to store the mineral resources of entire star systems. Just don't forget to upgrade also the turning jets and anti-matter thrusters. Treasure Planet: Battle at Procyon allows the player to customise ships by selecting crew and modifying the weapon mount configuration. Weapons may be refitted as long as they are the same weight class or lighter than their weapon mount, although certain weapon banks cannot be refitted, such as hull mounted guns and any special weapon. The ship's crew can also be selected to improve the ship's handling in certain areas, such as speed, maneuverability, repair rate, weapon accuracy and boarding strength. Refitting weapons or selecting crew costs Victory Points, with better crew and more powerful weapons costing more Victory Points. In Ratchet & Clank, certain games of the series allows you to customize your weapons. Ratchet: Deadlocked lets you attach mods that alter your weapon statistics as well as add some secondary effects such as Chain Lightning, ice damage or even napalm. Ratchet & Clank Future: A Crack In Time has Constructo weapons, which are modifiable versions of the pistol, shotgun and the bomb glove that can be altered with different parts. This is baked into all weapons to some degree with the weapon mods system. Modding is an essential skill to Warframe, because it allows players to adapt their loadout to the many, many situations they would find themselves in, or turn a mediocre weapon into a high-power death machine. Mods do many things, such as modify crit chance or multipliers, or add elemental damage types. There are four base elemental damage types (Heat, Cold, Electricity, and Toxin) and placing two mods of certain combinations in a weapon creates secondary elemental damage types (Gas, Radiation, Magnetic, and Corrosion). This also works if the weapon has an elemental type as a base damage, meaning that adding a single elemental mod can turn a flamethrower (base heat damage) into a strange hybrid weapon that sprays out corrosive acid or radioactive fallout. Actual weapon building was introduced with the Plains of Eidolon, in the form of Zaws. The player can buy the plans for parts (strike, grip, and link) to be forged together by the craftsman Hok. Optimized Zaws are often compared to or exceed the damage output of comparable Prime Weapons. A secondary weapon equivalent, Kitguns, were introduced in the Fortuna update, featuring similar mechanics. Sugar Rush from Wreck-It Ralph features a minigame where you can bake your own cake kart in one of four stock models. The mixing and baking stages are purely skill-based challenges (how performance affects the result is unclear; Vanellope's car turned out fine despite letting several junk ingredients into the mix), but the decorating stage lets you get creative.